ABL volume is up from last year, with Q1/14-Q3/14 new-money deals substantially higher, six percentage points, than the same time last year. Refinancings continue to dominate, and demand still outpaces supply — pushing pricing downward. 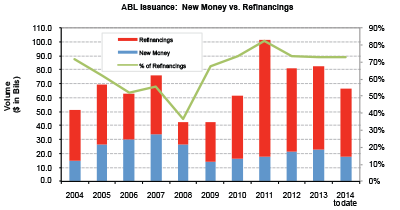 But there has been a return to more traditional ABL refinancings, with fewer opportunistic refinancings in Q3/14. Refinancings continue to dominate the asset-based lending market this year, though new money issuance has increased substantially from what the market saw during the first three quarters of 2013. That says, demand continues to outpace supply, pushing pricing downward. Year-to-date ABL volume stood at roughly $66 billion at end of the third quarter, compared with just over $57 billion for the same period last year (Exhibit 1). Of that, this year’s Q1-Q3 new-money deal flow totaled $18 billion, or 27%, compared with less than $12 billion, or 21%, for the same period in 2013 (Exhibit 2). In fact, there was $22.6 billion of new money issuance in all of 2013, so with a the last quarter still outstanding the market is already creeping close to last year’s total (Exhibit 3). Still, the numbers are not what one might call outstanding. “The ABL market has been humming along, but it hasn’t been able to pick up M&A the way that the broader leveraged loan market has,” says Maria C. Dikeos, director of analytics, Thomson Reuters LPC. “That’s in part because there hasn’t been that much sponsored activity. There have been some corporate-to-corporate buyouts where cash-flow lenders have been able to profit, but an asset-based loan is not going to be as valuable in that scenario because corporates right now are so liquid. They have a lot of cash on their balance sheet, and there’s less of an advantage to add an ABL” (Exhibit 4). 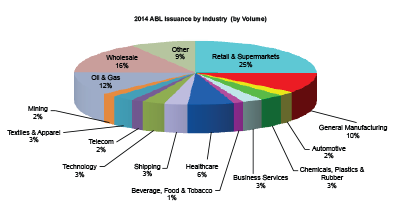 Indeed, only 13% of all ABL transactions in the first three quarters of this year were used to finance M&A (Exhibit 5). Of that deal flow, 65% came in the form of corporate financings, while deals from private equity sponsors represented 35%. This is more in line with historical levels. 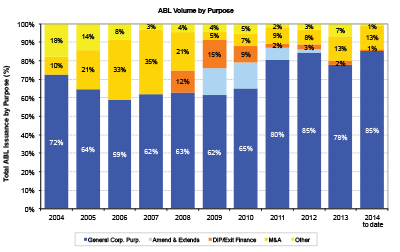 In the second half of 2013, corporate issuance had increased to more than 80% of total ABL transactions. So this year’s volume represents a rebalancing in M&A activity. One bright spot in the ABL market has been the number of jumbo financings of $1 billion or more. In 2013, there were 15 ABL transactions of $1 billion or more for the year, while so far this year 16 such deals have been completed, and there are another two more in the works: a refinancing for Hertz and a $3 billion ABL loan for Albertson’s that is part of a larger M&A credit. Looking at overall distribution by deal size, more than half the market, 53%, is comprised of deals smaller than $150 million. Another silver lining in asset-based lending this year has been a return to more traditional ABL refinancings, with fewer opportunistic refinancings in the third quarter. “In the last few years, we saw a lot of issuers refinancing because they wanted lower spreads, or wanted to loosen terms and conditions; it was very opportunistic,” Dikeos says. “What’s happening now is that the refinancings that are coming to market are credits that really need to be refinanced; they need to push out maturities” (Exhibit 6). 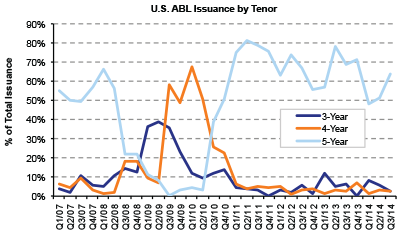 In terms of pricing, the overall ABL market has seen spreads tighten and transaction terms loosen over the last several quarters. For example, of all transactions of $75 million or greater, 17% were pricing at LIBOR +150 bps at the beginning of the year; by the third quarter that had risen to 33%. Meanwhile, the number of transactions priced at LIBOR +275 bps dropped from 7% of deals in the first quarter to 2% the third quarter. During the second and the third quarters, more than 50% of ABL transactions priced in the LIBOR +150 bps to LIBOR +175 bps range (Exhibit 7). Another contributor to tight pricing in the ABL market is that the ABL lending community has not been able to get behind a concerted pricing correction the way the cash-flow market has. “The last time that asset-based lenders really pushed back on pricing and were able to see a sustained uptick was in late 2008 and 2009,” Dikeos says. Market participants have noted some chipping away at upfront fees and some areas of terms and conditions; however, this information is purely anecdotal. On the regulatory front, Dikeos says it is not clear whether the uncertain environment will limit ABL lending. In theory, it shouldn’t since the leveraged lending guidance excludes asset-based loans in its definition. However, lenders are wary, especially in cases where ABL deals come in combination with capital markets offerings which push the 6.0 times leverage threshold. 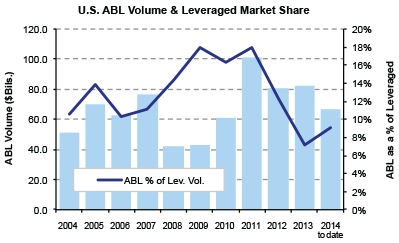 The bigger picture for ABL volume is that, historically speaking, the overall numbers remain quite strong. The market set a record in 2011 with more than $100 billion of issuance. Last year’s total, at $82.5 billion, represented the second-largest volume wise. And this year is poised to top 2013. The challenge for ABL lenders continues to be the disappointing number of new money deals, though the market is trending back toward historical pre-crisis norms in that area as well. 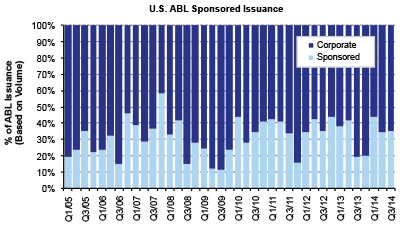 Since 2009, when all issuance plummeted for obvious reasons, new-money ABL volume has steadily increased. If the market stays on track for the remaining quarter, it will be that much closer to the $27 billion worth of new-money transactions completed in 2008. Carol J. Clouse is a freelance business and finance journalist and an ABF Journal contributor.